Tissue/ cell preparation, acute monocytic leukaemia cells (Human). Our Abpromise guarantee covers the use of ab20222 in the following tested applications. WB Use at an assay dependent concentration. 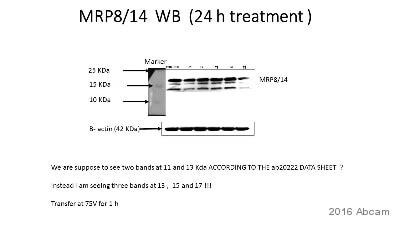 Predicted molecular weight MRP8 10.8 kDa, MRP14 13 kDa. MRP8 and MRP14 are members of the S100 family of proteins containing 2 EF hand calcium binding motifs. S100 proteins are localized in the cytoplasm and/or nucleus of a wide range of cells, and involved in the regulation of a number of cellular processes such as cell cycle progression and differentiation. S100 genes include at least 13 members which are located as a cluster on chromosome 1q21. Publishing research using ab20222? Please let us know so that we can cite the reference in this datasheet.